Which are the Best Tax Saving Options for 2018-19? What are the Best Tax Saving Options for Salaried for 2018-19?Financial Year 2018-19 already started. However, many of us sadly get up at the end to look for best tax saving options. Instead, it is always best to start tax planning for the first day of financial year. Hence, let us look at the options available. Tax Planning or Tax Saving is not a bad concept. But the bad concept is to invest JUST FOR SAVING TAX. Instead, you have to first identify your financial goals. Based on the time horizon of the goal, do the asset allocation between debt and equity. Within debt or equity, while finally investing, you may choose the product which also gives you an option to save tax. However, many of doing the reverse. We all in the asleep mode for the whole financial year. We get up during the financial year-end. In a hurry to save tax, we invest in bad products which in no way may help us to reach our financial goals. Tax Planning or Tax Saving must start from the first day of financial year. This will give you the advantage to plan well and save tax. Actually, I have to put this under Deductions. However, this standard deduction replaced the existing allowances. Hence, I placed it here for better understanding. Earlier you used to claim Rs.15,000 under Medical Allowance and Travel Allowance. However, with effect from FY 2018-19, you can claim the direct Rs.40,000 deduction instead of these two allowances. This deduction obviously for salaried and pensioners. This is irrespective of the amount of taxable salary you will be receiving to get a deduction of Rs.40,000 or taxable salary, whichever is less. Hence, let us assume for FY 2018-19, you worked only for few days. Your salary is taxable salary is Rs.50,000. In such scenario, you can directly claim the deduction of Rs.40,000. However, if your salary is less than Rs.40,000 (say Rs.20,000), then you have to claim only Rs.20,000 but not Rs.40,000. If your employer offering you the mobile/telephone connection or internet connection which requires for work, then you can claim 100% of such cost. However, you have to produce the bill. Only the postpaid connections are allowed for reimbursement. The bills for your travel against LTA can be claimed for exemption. It is allowed to be claimed twice in a block of four years. The current block is 2014 to 2017. You can carry forward your unclaimed LTA to the next year. You can request your employer to not deduct tax on it and allow you to claim it next year. You may be getting this allowance. However, the exemption is available only for Government employees. The amount of exemption is least of the following. This is the famous exemption which is used by many salaried individuals. However, the wrong belief is that whatever the rent they pay is actually exempted from their income. The reality is different. The amount of exemption is least of the following. If your employer providing this allowance, then you can take exemption up to Rs.100 per month per child (maximum of up to 2 children). Therefore, monthly you can save Rs.200 from this allowance. The exemption may seems so low. But why to pay the tax? This is the different allowance than transport allowance. It is the expenditure granted to an employee to meet the expenses on conveyance in performing of his office duties. There is no limit for this. If such conveyance allowance is Rs.5,000 a month, then whole allowance is exempt. Hence, you may this may be exempt to the extent of expenditure incurred for official purposes. Here also no limit. The employee can claim exempt to the extent of expenditure incurred for official purposes. If you are not placed in normal duty place, then your employer may provide you such allowance. The employee can claim exempt to the extent of expenditure incurred for official purposes. Now let us discuss the deductions available for 2018-19. Using these deductions you can save the tax. This is the famous section which often used by all of salaried. The maximum limit for the current year is Rs.1,50,000. Therefore, up to Rs.1,50,000, you can save tax on salary income from this section alone. The different investments you do and can also be claimed under Sec.80C are listed below. Stamp duty and registration cost of the house. Deduction under Sec.80CCC is available only for individuals. Contribution to an annuity plan of the LIC of India or any other insurer for receiving the pension. Do remember that the amount should be paid or deposited out of income chargeable to tax. The maximum amount deductible under Sec.80CCC is Rs.1.5 lakh. Do remember that this is also the part of the combined limit of Rs.1.5 lakh available under Sec.80C, Sec.80CCC, and Sec.80CCD(1). An individual’s maximum 20% of annual income (Earlier it was 10% but after Budget 2017, it increased to 20%) or an employees (10% of Basic+DA) contribution will be eligible for deduction. There is a misconception among many that there is no upper limit for this section. However, the limit is least of 3 conditions. 1) Amount contributed by an employer, 2) 10% of Basic+DA and 3) Gross Total Income. This is additional deduction which will not form the part of Sec.80C limit. The deduction under this section will not be eligible for self-employed. 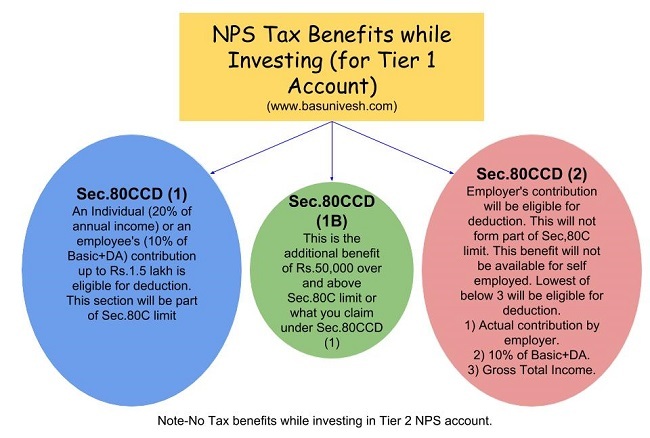 I explained all three sections of NPS (Sec.80CCD1, Sec.80CCD2 and Sec.80CCD(1B) in below image for your reference. NOTE:- PLEASE NOTE THAT THE COMBINED LIMIT OF DEDUCTION UNDER SEC.80C, SEC.80CCC AND SEC.80CCD(1) TOGETHER CAN NOT EXCEED RS.1,50,000 FOR FY 2018-19. Deduction under this section is available if you satisfy the following conditions. The taxpayer should be an individual (resident, NRI or Foreign Citizen) or HUF. Payment should be made out of income chargeable to tax. Payment should be in NON-CASH mode (for preventive health check up, you can pay either through cash or non-cash mode). In Budget 2018, the maximum tax deduction limit for senior citizens under Sec.80D is raised to Rs.50,000. The earlier limit was Rs.30,000. 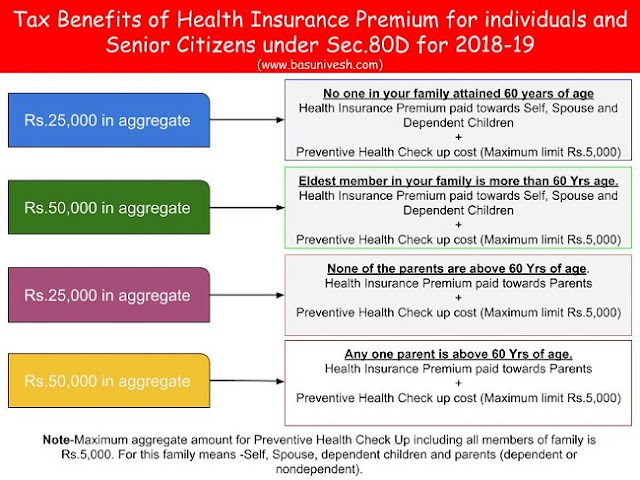 In case of single premium health insurance policies having a cover of more than one year, it is proposed that the deduction shall be allowed on a proportionate basis for the number of years for which health insurance cover is provided, subject to the specified monetary limit. I will try to summarize the whole benefit from below image. A resident individual or HUF is allowed to claim the deduction under Sec.80DD. You can claim the deduction if you incurred an expenditure for medical treatment, training, and rehabilitation of dependent relative (being a person with a disability). A deduction can also be claimed if an individual or HUF deposited or paid for any approved scheme of LIC (or any other insurance) or UTI for the maintenance of such dependent relative. Here, dependent means spouse, children, parents, brothers, and sisters, who is wholly and mainly dependent upon the individual. You can claim a fixed duction of Rs.75,000 under this section. A higher deduction of Rs.1,25,000 is available if such dependent relative is suffering from severe disability. An Individual’s of HUFs expenses actually paid for medical treatment of specified diseases and ailments subject to certain conditions can be claimed under this section. The maximum deduction is Rs. 40,000. This can also be claimed on behalf of the dependents. The tax deduction limit under this section for Senior Citizens and very Senior Citizens (above 80 years) is now revised to to Rs 1,00,000. With effect from the assessment year 2016-17, the taxpayer shall be required to obtain a prescription from a specialist doctor (not necessarily from a doctor working in a Government hospital) for availing this deduction. You can claim the deduction for the medical treatment of self, spouse, children, parents brothers, and sisters of the individual. The ailments covered under this section are as below. An individual can claim deduction under Sec.80E. If the loan is taken by an individual for any study in India or outside India, then they can claim the deduction. The interest part of the loan on such education loan can be claimed for deduction for pursuing individual’s own education or for the education of his relatives (Spouse, children or any student for whom the individual is legal guardian). The entire interest is deductible in the year in which the individual starts to pay interest on the loan and subsequent 7 years or until interest is paid in full (i.e for total 8 years). But do remember that interest should be paid out of the income of chargeable to tax. First time Home Buyers can claim an additional Tax deduction of up to Rs.50,000 on home loan interest payments under this section. Below are the few conditions for this. He must be an individual (Resident or Non-Resident). Loan must be taken for the acquisition of the property. Loan should be sanctioned after 2016-17. Loan amount should not exceed Rs. 35 Lakh. The home buyer should not have any other existing residential house during the sanction of loan. Do remember that if you claimed the interest under this section, then the same can’t be claimed under other sections for deductions. Donations to certain approved funds, trusts, charitable institutions/donations for renovation or repairs of notified temples, etc can be claimed as a deduction under this section. This deduction can only be claimed when the contribution made by cheque or draft or in cash. In-kind contributions like food material, clothes, medicines etc. do not qualify for deduction under this section. From FY 2017-18, the limit of deduction under section 80G / 80GGC for donations made in cash is reduced from current Rs 10,000 to Rs 2,000 only. I have written a complete post on this section. Refer “Section 80GG Deduction-Get Tax Benefit on rent paid if not getting HRA !!!“. I will give you the brief about this section as below. This section only applies to those who have not availed HRA in their salary or not claiming the deduction on their rent in any of the other sections of income tax. Below are a few conditions to avail the deduction under this section. Tax Payer himself or spouse/Minor Child/HUF of which he is a member should not own any accommodation at a place where he is doing a job or business. If Tax Payer owns a house at a place other than the place noted above, then the concession in respect of self-occupied property is not claimed by him [Under Section 23 (2) (a) or 23 (4) (a)]. How much amount of deduction one can avail under Sec. 80GG? A deduction of up to Rs.10,000 can be claimed by an individual or HUB in respect of any income by the way of interest on deposits (not on FDs) in a savings account with a bank, co-operative society or post office. This section is for Senior Citizens. The interest income earned from Bank FDs, RDs (including Post Office), will be exempt up to Rs.50,000. This deduction can be claimed under new Section 80TTB. However, if the taxpayer claimed deducted under Sec.80TTB, then he can not claim the deductions under existing 80TTA. To claim tax benefits under Sec.80U, the taxpayer should be an individual and resident of India. If he is suffering from 40% or more than 40% of any disability, then he can claim a tax deduction. You can claim the fixed deduction of Rs.75,000. a higher deduction of Rs.1,25,000 is allowed in respect of a person with a severe disability (i.e. having a disability of 80% or above). The interest part of your home loan EMI will be claimed under this section. The maximum limit for the self-occupied property is Rs.2,00,000 per year (even if you have multiple houses). For let-out property, earlier the entire interest payment of home loan (Loss from House Property) can be allowed to set off against any other income source without any limit. However, effective from FY 2017-18, this set-off now limited to Rs.2 lakh per individual (irrespective of the number of properties you are holding). The unclaimed loss if any will be carried forward to be set off against house property income of subsequent 8 years. In most of the cases, this can be treated as DEAD LOSS. The tax rebate of Rs.2,500 for individuals with income of up to Rs 3.5 Lakh has been proposed in Budget 2017-18. To avail this benefit, there are certain conditions and they are as below. The taxpayer must be a resident individual. Your Total Income (Less Deductions from 80C to 80U) is equal to or less than Rs.3,50,000. The rebate is the 100% of income tax on such income or Rs.2,500 (whichever is less).